Fresh Products Washer Fresh Wipes easily and conveniently keep high-efficiency washing machines sparkling clean and smelling great. Our wipes powerfully clean and effectively lubricate the vulnerable rubber boot and the rubber seals of your washing machine so that you continue to enjoy years of effective, problem free cleaning action. Washer Fresh Wipes are pre-moistened to efficiently dispense one at a time as well as utilizing a resealable container that keeps unused wipes fresh, moist and ready to use. Our disposable wipes let you start with a clean wipe each time that leaves behind a fresh, light and clean scent. Washer Fresh Wipes are safe to touch, use no harmful chemicals and are biodegradable. Use once a month for maximum performance. Try our 2 Pack (2 Packages with 6 Power Pack pouches in each package). Remove odour-causing residue on your high-efficiency washing machine rubber door seal, glass, detergent trays and dispensers. Clorox<sup></sup> Wipes Disinfecting are great for cleaning and fighting bacteria & virus throughout your home. These disinfecting wipes kill 99.9% of bacteria, including cold and flu, Staph, Strep, E.coli, Salmonella & Listeria. Clorox<sup></sup> Wipes Disinfecting are easy to use and work on a variety of hard, nonporous surfaces, including mirrors and glass. The powerful cleaning technology dissolves kitchen grease and fights soap scum. For convenient cleaning and disinfecting, keep this canister in your kitchen or bathroom or at your desk at work. Use these wipes anywhere messes or dirt may build up. Clean and disinfect anytime with the convenience of Clorox<sup></sup> Wipes Disinfecting. Dishwasher Fresh powerfully attacks the hard water residue build-up in your dishwasher and dissolves even the toughest, stinkiest soap scum. Our convenient pre-measured tablets are simple and easy to use and powerfully combat food stains, soap scum, and smelly build up while refreshing your dishwasher and leaving your dishes sparkly clean. Dishwasher Fresh leaves behind a light and clean lemon-fresh scent that lasts for weeks. Use once a month or more/less frequently as required based on usage. Our tablets are environmentally friendly and biodegradable. Try our 2 Pack (2 Packages with 3 tablets in each package). High Efficiency Washing Machine Wipes - 2 Pack Fresh Products Washer Fresh Wipes easily and conveniently keep high-efficiency washing machines sparkling clean and smelling great. Our wipes powerfully clean and effectively lubricate the vulnerable rubber boot and the rubber seals of your washing machine so that you continue to enjoy years of effective, problem free cleaning action. 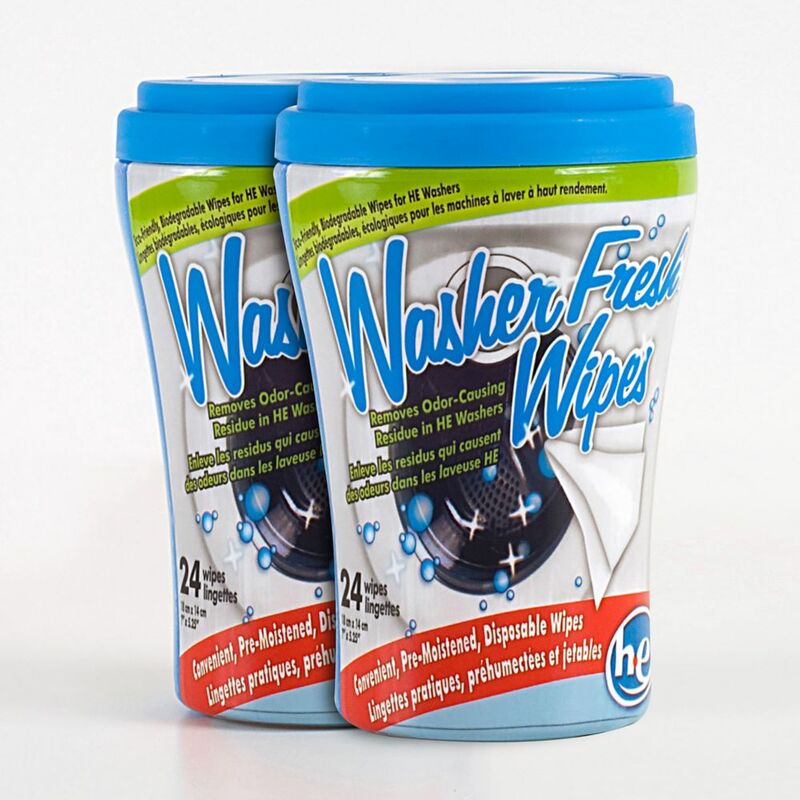 Washer Fresh Wipes are pre-moistened to efficiently dispense one at a time as well as utilizing a resealable container that keeps unused wipes fresh, moist and ready to use. Our disposable wipes let you start with a clean wipe each time that leaves behind a fresh, light and clean scent. Washer Fresh Wipes are safe to touch, use no harmful chemicals and are biodegradable. Use once a month for maximum performance. Try our 2 Pack (2 Packages with 6 Power Pack pouches in each package).